Will Genetic Engineering Bring Killer Tomatoes to Grocery Stores? Crop genetics conjures fears of Frankenstein in some minds and hopes for technological advancements in others. 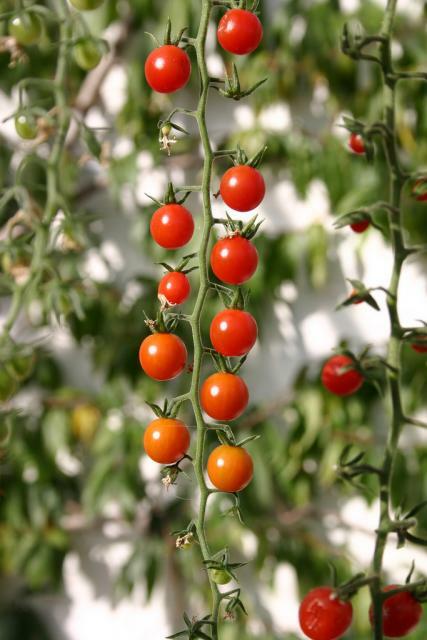 Biologists have recently decoded and published the entire tomato genome. What does that mean for us, the consumers? A gene is a segment of DNA with a single instruction for running an organism. All the genes in an organism are collectively known as that organism's genome. Knowing the tomato genome gives researchers clues about the plant's proteins and could lead to improved crop quality and larger harvests. So far, researchers have sequenced two genomes - one of a tomato variety called "Heinz 1706" and one of the undomesticated ancestor of the garden tomato. Crop developers will be able to compare the DNA of other varieties to both theses genome in order to deduce which genes give those varieties their unique characteristics. The published sequence will also help scientists compare tomatoes to related crops such as peppers, potatoes and others. Full post: Will Genetic Engineering Bring Killer Tomatoes to Grocery Stores?